Finished up this little quilt over the weekend, which is going to a very special baby! I do love this pattern, but time was of the essence, so I went with my gut and featured only four flowers surrounded by a wide border. I wasn't sure if white was really practical for a baby quilt, but after talking with a friend who is a mom, she said that her white baby quilt hasn't gotten very dirty. She also said that white is such a pure color, and thus perfect for a baby. After making this quilt, I agree! Our friends painted their nursery purple, and they were afraid it was too purple, so I hope all the white in this quilt will help balance it out. The pattern is Retro Flowers and the prints are Jennifer Paganelli (Honey Child), Lotta Jansdotter (Echo), Joel Dewberry (Heirloom) and Anna Maria Horner (Innocent Crush). The background is Kona White and I chose Kona Ash for the binding. For the back, I used a Michael Miller print designed by Paula Prass called "Woodland Delight." I think it should be called crazy chevron, because when you stare at it, it's like an optical illusion. I won't show you any close ups of the back, because I was having some issues with my tension and there are "eyelashes" all over the back. Sigh. This little machine has been so great for me, but I'm feeling like it's time to upgrade, or else I am going to end up sending all of my quilts to a long armer. So, I'm looking for recommendations, friends. What type of machine do you sew on, and how is it for free motion quilting? Is it a love-hate relationship, or all candy and roses? Thanks for your advice! Linking up to Sew Modern Monday! This is so perfect for a simple, modern baby quilt! I'm sure it will look lovely in their nursery. And if you find a machine that is all candy and roses let me know! It's perfect for a baby! Love the wide white border. Such a lovely cute quilt and I love the calmness of the white background with the contrast of the crazy chevrons!! I am still to actually make a quilt of any size but I love my Bernina machine for free motion quilting when I have used it on other things. Normal tension, new needle and it's a star!! I haven't used it for free-motion quilting (yet) but my mom LOVES her Janome 6600. My Janome 6600P is much bigger and better for quilting, but no stitch regulator. Love the old Pfaffs, but the newer ones aren't as nice. Husqvarna Viking is what a lot of my Mennonite friends use and some are good and some not so good. If I had a big house and lots of cash, I'd buy and learn to use a longarm, you just can't beat them for the quality of quilting they produce. This is just perfect Lindsay... man, seeing this and another quilt yesterday (one of Crazy Mom Quilts' new patterns) have just convinced me to buy some white Kona. Would you believe I have none in my stash? lol. I don't wear it & I guess that was running over into my quilting too....time for a change! I have a brother innov'is from the quilter's collection. i have really loved it. the arm is wider than standard machines, and definitely not quite that of a longarm. i do agree with anne, changing the needle can help with tension problems if the needle is dulled. also rethreading your machine. if that still doesn't work, see if you can adjust the tension manually. also speed of machine to hand movement has a huge effect on the backside. This is so lovely! I really like the four flowers surrounded by so much white. It's exactly what this kind of quilt block needs since it is such a modern design. Recently, one of our fellow craft blogger (I bet you know her too) :) posted about how much she would love a certain type of sewing machine, and low-and-behold the company is now sending her one, gratis! I wonder if it would work twice... ;) LOL! This is such a cute quilt. 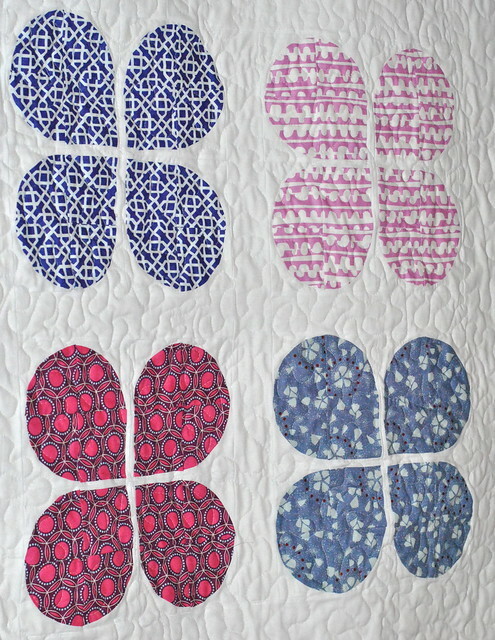 I can't make any recommendations because I haven't branched out into FMQ--only straight line quilting. 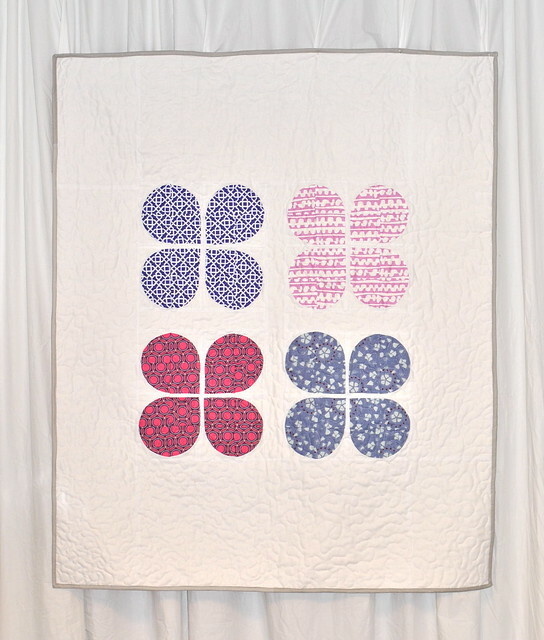 I know Crazy Mom Quilts does tons of FMQ on her Juki and loves it. Lovely quilt! I think all of the white space is awesome. I wouldn't worry about using white in baby quilts. Sure, it may get dirty, but that's what washing machines are for! Such a sweet quilt! This pattern is perfect for little girls. Love the fabrics. I use a Bernina. My lqs has a sale every February and I got it then. I've had some issues with it, but the store has stood by the machine for me. Overall it's a great machine. I have an old Janome that my mum gave me but it's pretty reliable so far! 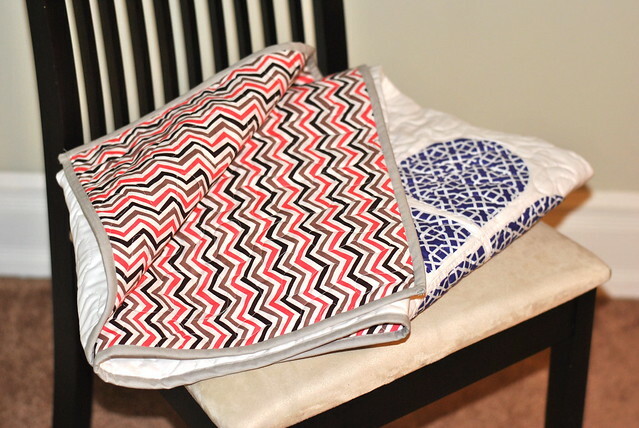 I love this pattern, and the chevron is a great choice! Beautiful, Lindsay. I love the simplicity. Very nice. 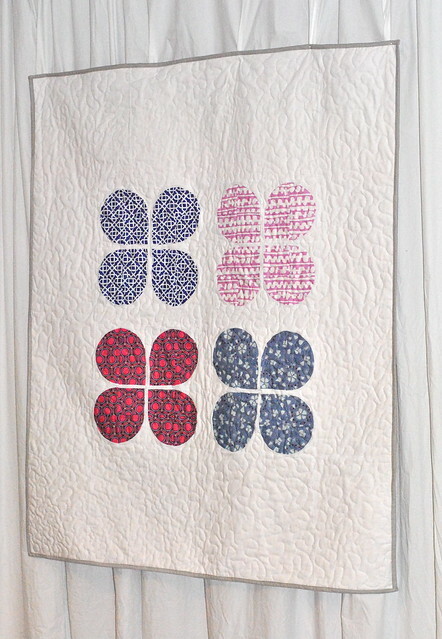 I really like how the quilt looks with just the four flowers. I just made my first FMQ quilt yesterday so I'll reserve commenting until I've tried a few more times. It's beautiful and perfect for a modern baby quilt!